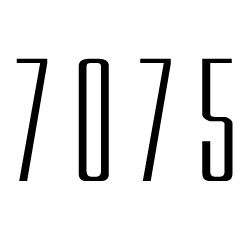 7075 is an aluminum alloy, with zinc as the primary alloying element. It is strong, with a strength comparable to many steels, and has good fatigue strength and average machinability. Utilized mainly where a high strength to weight ratio is essential. Applications include aircraft fittings, gears and shafts, fuse parts, meter shafts and gears, missile parts, regulating valve parts, worm gears, keys, and various other commercial aircraft, aerospace and defense equipment and components.